Dj Ryz is a purveyor of Infectious & up beat Old Skool Rave Classics right across all respected music genres, Providing a fun & feel good atmosphere. Ryz is never afraid to express his creativity on the turntables, his emotive musical selections are his own therapy. Growing up with a love for Rave music, London breakbeat sounds, European Techno, house & Hip-hop. Ryz ended up with quite a mixed spectrum of musical influence. Today this translates into his sets where he infuses together all the pieces of music he loves with a unique style of mixing & scratching. It’s this style which both intrigued Reprezent Radio & The Prodigy who had him open there 2018 No Tourists leg of there British tour at Glasgow’s SEC. Also going on to headline ‘Warehouse 91’ Rave at Glasgow’s SWG3. A very active member of his local community Ryz is no stranger to the up’s & down’s of a small town music scene. Both himself & Dj partner in crime who share a keen interest in that respected genre of music host a small & so far successful night dedicated to rave called ‘JOY’. 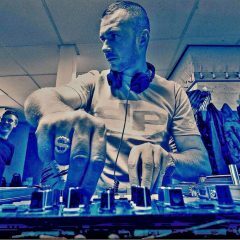 Ryz is also a resident to the much established club night ‘Audiolife’ both dj’ing & putting out mixes for there radio show. For Ryz it’s all about the love for the music, Taking you on a musical journey back in time to the care free Warehouse rave days & seeing happy smiley faces moving on the dance floor to music he is so passionate about. You can find Dj Ryz & his mixes on Facebook, Mixcloud & Soundcloud.